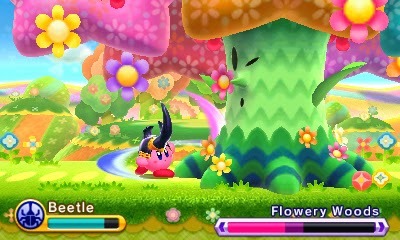 Kirby: Triple Deluxe feels like it should have been a launch title for the 3DS. It’s a game in a high-profile Nintendo franchise that doesn’t break the mold too much with few interesting improvements to the formula and a bunch of hardware gimmicks that do nothing but get in the way of the fun. It even has a name - Triple Deluxe - that’s a play on the name of the system it’s on. 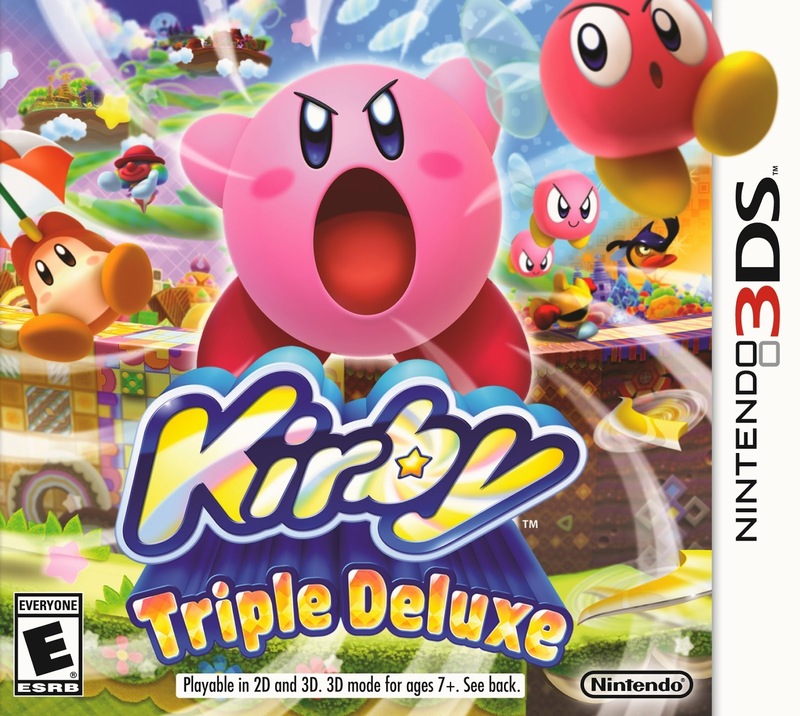 Triple Deluxe is a pretty standard Kirby game, and those familiar with the franchise will feel right at home while those new to the party will have little difficulty picking it up. 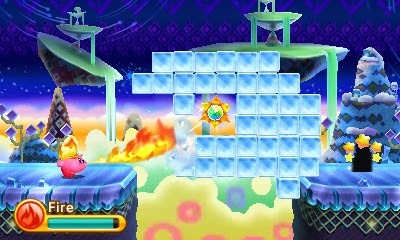 Kirby: Triple Deluxe is an uncomplicated platformer with the central mechanic of copying abilities. 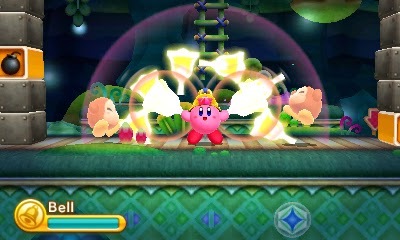 Protagonist Kirby can inhale most enemies, and doing so allows Kirby to use their powers if they have any. Inhale a blade knight and Kirby gets a sword and matching green floppy hat (a nod to the Legend of Zelda series) or inhale a flaming enemy to get fire powers. The various copy abilities range from elemental powers (fire, ice, leaf) to weapon-based powers (sword, spear, archer) to more esoteric powers (circus, bell, beetle), and every ability comes with an accompanying move set that changes the way kirby behaves and deals with enemies. The properties of the different powers can also be used to solve puzzles. You might light the fuse to a canon with a flame attack or cut a rope with a sharp power like sword or leaf. It’s a fun system and constantly switching powers keeps gameplay from becoming stale, but if you’re a Kirby veteran, there isn’t anything new to see here except for a handful of new copy abilities. In fact, the gameplay is a beat-for-beat retread of Kirby’s Return to Dreamland on the Wii, and every power that returns from that game functions near identically to that game. Occasionally, Kirby will be given access to the powerful Hypernova ability, increasing his inhaling suction by an enormous degree. 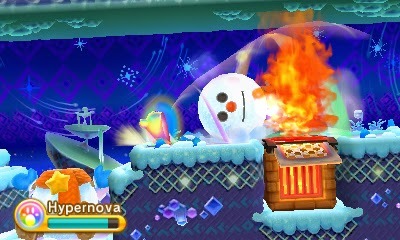 Once again, if you’ve played Return to Dreamland, this will feel very much like the Ultra copy abilities from that game. Hypernova sequences are chances to get a bit of a power trip and do some non-standard puzzle solving, but they’re rarely interesting enough to justify the time they take. On the whole, the level design in Triple Deluxe leaves a lot to be desired. There’s not even much interesting to say about it. It’s just kind of bland. Interesting ideas - like sections with illusory floors and invisible enemies all revealed in a large mirror - are sadly in the minority. There are also the hardware gimmicks holding Triple Deluxe back. One new mechanic is the ability to travel between the foreground and background using mini warp stars, but in practice, this means of traversing the environment is little more than a fancy door to a new area. Sometimes this is used in an interesting way, like when Kirby gets a canon hat that lets him attack from one layer to the other, but more often, it’s just an excuse to show off the 3DS’s namesake capability. 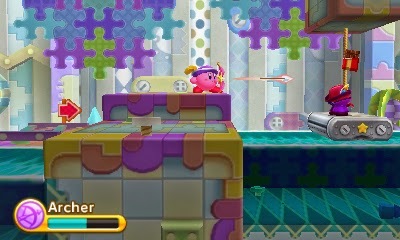 The emphasis on 3D environments also gets annoying when enemies travel beyond the 2D plane that Kirby traverses, as it can often be hard to tell exactly when the enemy is in that plane. Against regular enemies, this is an annoyance, but when bosses start using attacks that use the third dimension, it can become near impossible to tell exactly where it’s safe to dodge. Tilt controls also rear their ugly head. Most of the time, these could have been substituted for more traditional controls with no loss whatsoever, and in the cases where one must use both the buttons and tilting simultaneously, it feels like a more intuitive workaround could have been reached. There are also collectible keychains, which are utterly pointless in gameplay and exist only to shoehorn in a Streetpass feature for trading. I’ll lastly touch on story, which, as usual for a Kirby game, takes a backseat. It’s always been true that the quality of story in a Kirby game is inversely proportional to the number of words used to tell it. Kirby 64: The Crystal Shards still stands as the high water mark in this regard, telling its whole story without a single word spoken, with Kirby’s Epic Yarn taking last place with its overly wordy narration trying far too hard to be whimsical. Triple Deluxe stands somewhere in between, but far closer to the Crystal Shards end of the spectrum. The opening cutscene sets things up nicely without a word. Kirby goes to sleep one night only to wake up to find that his house and Castle Dedede have been lifted into the clouds by a magic beanstalk called the Dreamstalk. Kirby rushes to the castle only to find King Dedede, the self-proclaimed monarch of Dream Land, being taken away by an insectoid sorcerer and chases after them all the way through the six worlds that make up the game. The final stage does feature some dialogue, and the final boss fight is a spectacular multi-staged climax to the whole experience, but it does feel strange to have had almost no story context throughout the whole game only to see villains monologuing about their motives at the very end. All things told, Kirby: Triple Deluxe is hard to get enthusiastic about one way or the other. Its flaws aren’t enough to be deal breakers, but they are enough to drag its positive qualities down to mediocrity. It’s as fun as it ever is to use Kirby’s various powers, and the finale is truly great, but the shoehorned-in hardware gimmicks and uninspired level design keep the game from being anything more than something to remind us all that Kirby exists until his next big game. If you’re a Kirby fan, Triple Deluxe will scratch that itch, but it won’t really satisfy.